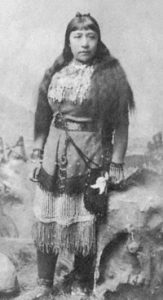 The Paiute fight back – Sarah Winnemucca was a Paiute activist. At first the Paiute didn’t see any of the Spanish invaders who conquered the Pueblo people around 1500 AD, but they still felt the effects of the invasion. Spanish demands for workers led the Navajo and the Ute to made raids into Paiute land to capture people to sell as slaves. Around 1700, the Paiute were able to buy horses from the Ute (and indirectly from the Pueblo people), and soon they were using horses a lot. How did the Pueblo get horses? Southern Paiute people met Europeans for the first time in 1776, when Spanish Franciscan priests reached them. Northern Paiute people didn’t meet any Europeans until 1820 or 1840. About the same time, many Paiute people died of European diseases – smallpox or measles – that they caught from the Nez Perce and the Shoshone. Some Paiute families, including the family of Sarah Winnemucca, decided to make their way among the white people. Sarah herself went to a Catholic mission school in California, where she learned to read and write English. Why did so many Native people die of measles? So the Paiute were already much weaker than usual when the Mormons, chased out of the United States for their religious beliefs, began to settle in Utah in the 1850s. At first, the Mormons made alliances with the Paiute against settlers who weren’t Mormons. Together, the Mormons and the Paiute killed 120 settlers in 1857 to try to keep Utah for themselves. But in the end, the United States Army forced both the Mormons and the Paiute to accept non-Mormon white settlers. At the same time, other European settlers began to move into Northern Paiute land, where they grazed cattle and cut down trees and generally used up or destroyed food that the Paiute needed. The Paiute made an alliance with the Shoshone to fight off the settlers and the United States Army which came to support the settlers. Fighting continued – alongside the Californian Natives who were also fighting – until 1878. When the fighting ended in a cease-fire, the United States government tried to move the Paiute to a reservation. But the land the government chose was a desert, without the lakes the Paiute need to survive. Many Paiute refused to move there. Others tried it and then left. Most Paiute people ended up moving to towns in south-eastern Oregon and Idaho, where they took jobs on white-owned farms or ranches. They lived in neighborhoods together with displaced Shoshone people. Starting in the 1930s, the federal government began to recognize some of these Native neighborhoods as reservations. 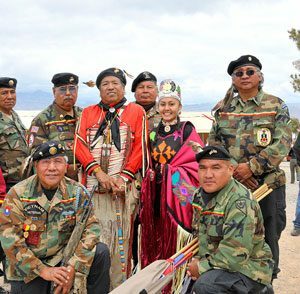 That’s where most Paiute people still live today – and some fight for the same United States army they once fought against. Need a second source? Check out this article from the Encyclopedia Britannica. Cite this page: Carr, K.E. The Paiute fight the United States. Quatr.us Study Guides, August 13, 2017. Web. April 23, 2019.